President Bush said Tuesday a new plan to increase U.S. and Iraqi forces in the besieged capital of Baghdad will help quell rising violence that is threatening Iraq's transformation to a self-sustaining democracy. "Obviously the violence in Baghdad is still terrible and therefore there needs to be more troops," Mr. Bush said in a White House news conference with visiting Iraqi Prime Minister Nouri al-Maliki. Al-Maliki, on his first trip to the United States since becoming prime minister two months ago, said he and Mr. Bush agreed that training and better arming Iraqi forces as quickly as possible, particularly in the capital city, was central to efforts to stabilize the country. The message of the day, CBS News chief White House correspondent Jim Axelrod reports, seemed very different than the president's first meeting with al-Maliki six weeks ago. Then, as al-Maliki briefed Mr. Bush on a plan to make Baghdad safer, they were both all smiles. But 100 Iraqi civilians have died every day since then, Axelrod reports. The new plan is aimed at curtailing sectarian violence that could fuel a worst-case-scenario acknowledged by the Iraqi leader, CBS Radio News White House correspondent Peter Maer reports. "God willing, there will be no civil war in Iraq," al-Maliki said, speaking through a translator. President Bush said that al-Maliki had asked for more military equipment from the United States and had recommended increasing U.S. and Iraqi forces patrolling Baghdad neighborhoods. "And we're going to do that," Bush said. The president said U.S. forces would be moved in from other parts of Iraq. He did not say how many, but Pentagon officials have suggested several thousands troops would be moved to Baghdad, including some now based in Kuwait. Not everyone is sold on the idea that moving U.S. troops to Baghdad from other parts of Iraq is a good idea. Military expert Anthony Cordesman with the Center for Strategic and International Studies said there aren't even enough troops in the areas troops are leaving. When they're shifted to Baghdad, Cordesman said he fears the places that are left behind risk becoming new hot spots for insurgents. There are roughly 127,000 U.S. troops in Iraq. The administration is under increasing pressure from Democrats and some Republicans to bring a substantial number home by the end of this year. Asked if the tense situation in Baghdad would alter the equation for an eventual withdrawal of U.S. forces, Mr. Bush said troop level decisions will still be based on recommendations from military commanders in the field. "Conditions change inside a country," Mr. Bush said. "Will we be able to deal with the circumstances on the ground? And the answer is, yes, we will." Iraqi and U.S. soldiers captured six members of an alleged "death squad" in Baghdad on Tuesday following the beginning of a military crackdown on sectarian violence threatening to divide the capital. U.S. and Iraqi soldiers raided four buildings in southwest Baghdad, detaining a cell leader and five other members of the group, according to a U.S. military statement. In Baghdad, the U.S. command said a soldier assigned to the 43rd Military Police Brigade was killed in action Tuesday north of Baghdad the 34th death this month among U.S. service members in Iraq. Representatives of Iraq's ethnic and sectarian groups met in Cairo, Egypt, to discuss ways to reconcile. Some 30 delegates representing Shiites, Sunnis, Kurds and other smaller minorities participated in discussions sponsored by the Cairo-based Arab League. The talks are intended to prepare for a national reconciliation conference in Baghdad next month. U.S. officials believe control of Baghdad — the political, cultural, transport and economic hub of the country — will determine the future of Iraq. In northeastern Baghdad, a suicide car bomber attacked a joint Iraqi-U.S. checkpoint, killing three. And at least 11 bullet-riddled bodies were found dumped in two Baghdad neighborhoods, police said. Elsewhere, gunmen attacked a police checkpoint in Dujail, 50 miles north of Baghdad, and ambushed a sport utility vehicle belonging to a private security company in north Baghdad, killing eight people. A police lieutenant colonel and a police major were slain in separate drive-by shootings in the northern city of Mosul, police there reported. Gunmen also shot dead an employee of the Iraqi customs service in Mosul. The president and the prime minister met privately before the news conference to discuss strategy, then continued talks over lunch with a larger group that included Cabinet members and aides. On Capitol Hill, where al-Maliki is to address Congress on Wednesday, some lawmakers threatened to boycott the speech because the Iraqi leader hasn't condemned Hezbollah's attacks on Israel, CBS News correspondent Bob Fuss reports. At the East Room news conference, Mr. Bush said al-Maliki was very clear in stating that "he does not want American troops to leave his country until his government can protect the Iraqi people. 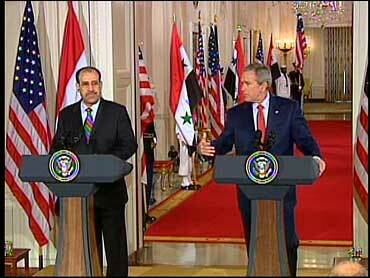 And I assured him that America will not abandon the Iraqi people." It was not clear how many U.S. troops will be in Baghdad as a result of the new plan. About two weeks ago, Defense Secretary Donald H. Rumsfeld said that the number of Iraqi and U.S. troops in Baghdad had recently grown from 40,000 to 55,000. Mr. Bush complimented the beleaguered leader for his courage and perseverance in the face of sectarian violence. Recent attacks have sapped political support for the more than 3-year-old war in Iraq, in both the United States and Iraq. The two leaders disagreed openly on how to end hostilities between the Hezbollah militia in southern Lebanon and Israel, with al-Maliki, a Shiite Muslim leader, reiterating his support for an immediate cease-fire and Mr. Bush sticking by the administration opposition to one. The administration insists that Hezbollah must first return two captured Israeli soldiers and stop firing missiles into Israel before any cease-fire. "I told him (al-Maliki) I support a sustainable cease-fire that will bring about an end to violence," President Bush said. Al-Maliki is to address Congress on Wednesday. Some Democrats said they might shun the Iraqi leader's speech unless he condemns Hezbollah as a terrorist organization and promises not to extend amnesty to Iraqis who killed U.S. troops. A group of House Democrats called on GOP leaders to cancel al-Maliki's address. Sen. Charles Schumer, D-N.Y., said he doubted he would attend and that there were a "large number of people (in Congress) who were uncomfortable" with al-Maliki's condemnation of Israel's attacks in Lebanon and apparent support for Hezbollah. Al-Maliki sidestepped a question at the White House news conference about his position on Hezbollah. "Here, actually, we're talking about the suffering of a people in a country. And we are not in the process of reviewing one issue or another, or any government position," al-Maliki said. Ahead of al-Maliki's speech to Congress on Wednesday, Mr. Bush was taking him to nearby Fort Belvoir, Va., for a meeting with U.S. troops and their families. Both leaders will "thank them for their courage and their sacrifice," President Bush said. The president said improved military conditions outside Baghdad will make it possible to move U.S. military police and other forces to the capital, where an estimated 100 people a day are being killed. The crimes, blamed largely on sectarian death squads, usually go unsolved. Al-Maliki said the most important element of a new security program "is to curb the religious violence." Iraq's government must have a policy that "there is no killing and discrimination against anyone," al-Maliki said. U.S. officials believe control of Baghdad — the political, cultural and economic hub of the country — will determine the future of Iraq. U.S. and Iraqi soldiers captured six members of an alleged death squad in Baghdad on Tuesday, while attacks elsewhere in Iraq left more than two-dozen dead.